Horchow coupons and Horchow free shipping codes are some of the best ways to score a discount deal on home decor from The Horchow Collection. 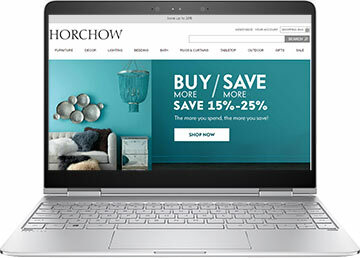 Using Horchow.com coupon codes and promotions it is possible to get instant discounts, free shipping, or other special deals on unique furniture, decor, lighting and bedding. Techies love cool designs. We’re always on the lookout for sleek gadgets and streamlined components, so it’s little wonder that we’d want our living spaces to look impressive too. That’s why we’re wise to log on to www.horchow.com for interior decorating ideas and designer styles. At Horchow, you’ll find sales and great values on products that can transform your house or apartment into a fashionable den. The Horchow collection includes furniture, bed and bath décor, lighting, tabletop accessories, rugs, curtains, outdoor décor, and desk and travel accessories. Broadway producer Samuel Roger Horchow unveiled The Horchow Collection in 1971. It was the first luxury mail-order catalog that didn’t follow the opening of a bricks-and-mortar store. In 1998, Neiman Marcus bought the collection and now many Neiman Marcus stores offer showrooms where you can see and touch select Horchow linens, lighting, furniture, and other home design products. Though once only accessible via a print catalog, Horchow’s opulent offerings are now available to browse and purchase online. Horchow works with some of the top designers to bring you the perfect fit for your home. They carry furniture from Bernhardt, John-Richard, Vanguard, Turning House, Jamie Young, French Laundry Home, Lauren by Ralph Lauren, Jonathan Adler, Old Hickory Tannery, and Ambella. Their bed and bath décor is brought to you by Ann Gish, Annie Selke Home Collections, Charisma, Donna Karan, Dransfield & Ross, Jane Wilner Designs, Matouk, and Sweet Dreams. They sell stylish décor by Amanda Brisbane, Christopher Guy, Nambe, Waterford, Maitland-Smith, Jinlu, and Janice Minor. They have cool designs in rugs and lighting fixture from Calvin Klien Home, the French Market Collection, Tracy Porter, Jamie Young, Martha Stewart Rugs, and Safavieh. Finally, their tabletop products are the result of the quality crafting of Caff Ceramiche, Spode, Cuisanart, SFERRA, KitchenAid, Operanova, Valpeltro, and Viking. If you’re looking for classic, comfortable seating that works in any setting, stop by the furniture section of the website. You’ll discover cool designs in sofas, leather sofas, chairs, sectionals, settes and chaises, benches, ottomans, and stools. The Horchow furniture collection also includes dining room furniture for traditional or banquet dining and the opportunity to mix and match tables, chairs, and other dining room essential to create your own unique style. For the bedroom they have beds, daybeds, and headboards. Since you’re at the computer all day, you might want some unique designs for the home office, like a Sanderson Writing Desk or a Henderson Secretary and Bench or the very original and very cool pillared chair and mirror desk. The Horchow Collection is a great place to find the luxury designs you need to dress your home to impress. Visit the Sales & Values section of the website to get outlet store type clearance deals right from the comfort of your own home.